These are the qualities of a well-crafted goal. For example, we want to acquire 36 properties (specific, measurable, and relevant) this year (time-bound). It should be attainable, but it is our stretch goal. Almost everyone agrees. You have to set goals if you want your business to succeed. This statement is a truism, because goals are how you define success. Let’s say you buy and sell 12 houses this year. Is that a success? It is if your goal was to do 12 projects or fewer, but what if your goal was to do 120 projects? Only you can define success for your business. Don’t let anyone try to convince you you’re not successful if you’re meeting the goals you establish for yourself. If you want to rehab just one house this year, you’re a success if you accomplish or start one project. If you do that, and you want to, you can set a higher goal next year. But you can’t stop with just setting a goal. That just starts the process. Let’s focus on 12 projects for the year. What do you have to do to get there? You can’t just look at 12 houses, buy them, rehab them, and sell them. Well, you can, but not if you want to make money and stay in business. Think about that. To buy a house, we had to have 25 prospects, and our acquisition rate is much higher than the industry norm. (One reason is we only track the prospects we spend time on, not everything that gets presented. And I still don’t expect to be able to keep the ratio that high this year.) To buy 12 houses, we would need at least 300 prospects. That’s more than one serious prospect every business day. And our actual goals are significantly higher than 12 projects this year. We don’t want to manage 36 at a time like some folks we know do, but we have shown we can certainly manage more than five at a time. And managing multiple projects requires managing your goals. Next time, I’ll talk about how I do that at Hermit Haus. 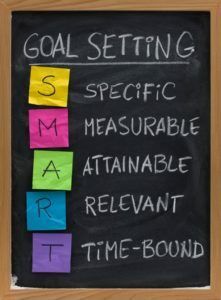 If you have questions about goal setting or want to help us attain our goals, email me or leave a comment.